Choose 1 or more design here. 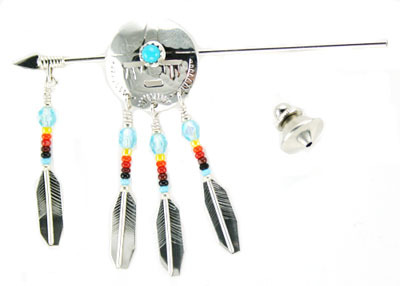 Navajo made, sterling silver, spear shield tie tack or hat pin with assorted 4mm stones and dangling feathers with assorted crystal beads and assorted seed beads. Center disc varies in cut out animals. Measures 3"L, disc measures 3/4" diameter, and feathers dangle 1 3/8"L. Artisan is Juanita Manygoats. Colors will vary in center stone and color of beads. You may not receive the color pictured. ****Only available with buffalo or steer head as cut out design****** Choose design when ordering or let us choose for you.